Tags: BOINC-Berkeley Open Infrastructure for Network Computing ( 25 ), IBM Corporation ( 15 ), Smarter Planet, WCG-World Community Grid ( 13 ), What's tech got to do with it? The growing impact of climate change – including more drought, water shortages, intense storms, rising sea levels, and extremely hot weather – has galvanized scientists around the world to work overtime in the search for solutions, often with limited resources. Their work will figure prominently in making the Paris Agreement real, which was forged in 2015 as a pledge by countries worldwide to combat climate change with lower carbon emissions. Recently business, academic and science communities with a presence in the US loudly reiterated their strong support for the accord, joining collaborative action such as the We Are Still In coalition. Over the last few decades, the private sector has discovered the innovation related to sustainability is not only the right thing to do, but is also good for business. Customers want to do business with environmentally responsible businesses, and companies reap efficiencies that make them more competitive and creative. 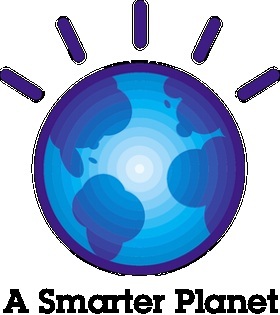 In fact, IBM itself has saved an enormous amount of money and done its part for the environment by meeting its own emissions and renewable energy sourcing commitments years ahead of schedule. But we want to do more. We want to equip the science community with the kind of resources it needs to fight climate change. Computational research is one such powerful tool for advancing climate change research and developing solutions. In fact, in awarding the 2013 Nobel Prize in Chemistry to a group of computer scientists who pioneered the field, the Prize Committee remarked that: “Today the computer is just as important a tool as the test tube.” The rapid growth in big data also holds valuable new insights. But to uncover those insights and leverage these techniques, scientists need much more computing power than they typically have access to. World Community Grid addresses that gap. 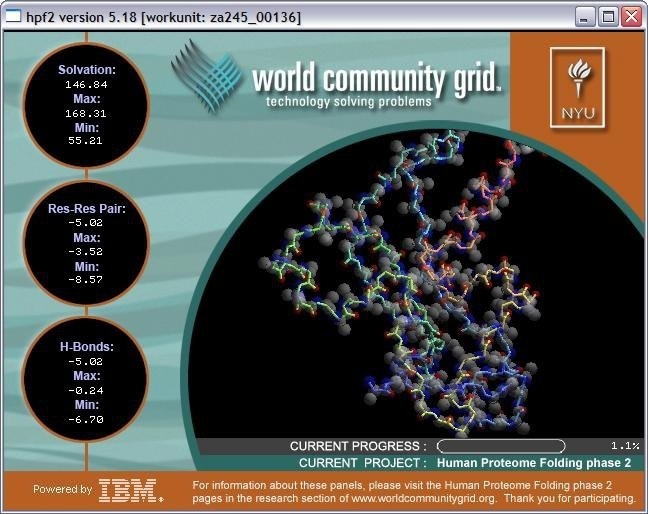 IBM’s World Community Grid is a crowd-sourced virtual supercomputer that is powered by the surplus computing power of computers and Androids donated by individual volunteers and organizations. Instead of wasting energy when idle or not in full use, hundreds of thousands of these devices redirect otherwise unused processing power to research scientists to collectively perform virtual experiments at an unprecedented scale. Through the contributions of over 730,000 volunteers and 430 organizations, worth $400m, World Community Grid’s research partners have completed the equivalent of thousands of years of work in just a few years, enabling important advances in environmental science. For example, scientists at Harvard University used World Community Grid to run the Clean Energy Project, the world’s largest quantum chemistry experiment with the goal of identifying new materials for solar energy. In just a few years, they analyzed millions of chemical compounds to predict their efficiency at converting sunlight into electricity. Their discovery of thousands of promising compounds will advance the development of cheap, flexible solar cell materials that we hope will be used worldwide to reduce carbon emissions and contribute to the fight against climate change. 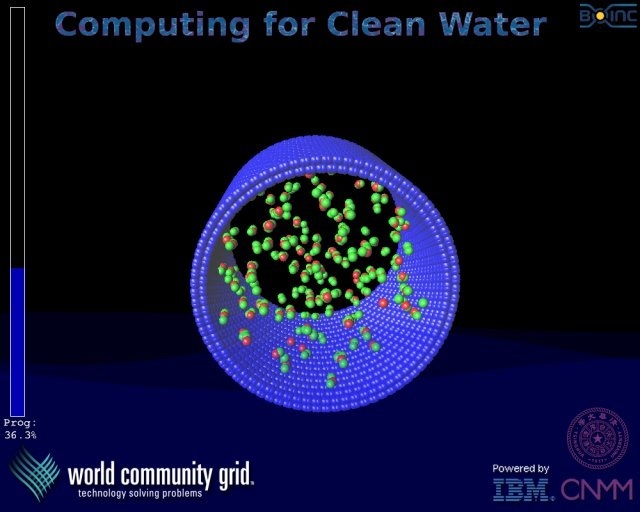 Another project, designed by a team of international researchers and led by scientists at Tsinghua University in China [Computing for Clean Water], undertook an unprecedented, massive computational simulation study powered by IBM’s World Community Grid. They found that the use of carbon nanotubes, under specific conditions, could potentially lead to more efficient water filtering with less expense and less impact on the environment. Another World Community Grid project helped scientists study the impact of water management and development policies on large watershed areas. 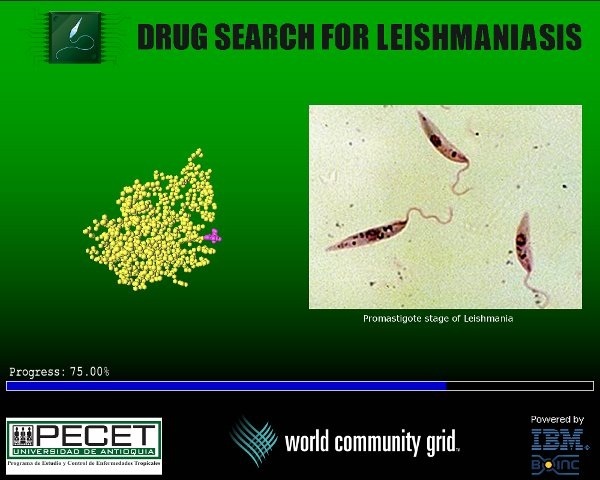 World Community Grid has also enabled medical breakthroughs. For instance, the Chiba Institute in Japan identified seven novel drug candidates that could potentially be used in new medicines that fight childhood neuroblastoma, one of the most common and dangerous childhood cancers. Tests showed that even at remarkably low doses, these drug candidates are very effective at killing cancer cells with no immediately apparent side effects. This week, the scientific community is being offered a new opportunity to advance the quest for ways to combat climate change. IBM is inviting scientists around the world to apply for a technology grant (valued at $40m) of crowd-sourced supercomputing power, meteorological data from The Weather Company, and IBM Cloud storage to support their climate or environmental research project. Up to five of the most promising environmental and climate-related research projects will be supported, with technology and services contributions valued commercially at approximately $200 million. These resources can support many potential areas of inquiry, such as impacts on fresh water resources, predicting migration patterns, and developing models to improve crop resilience. Proposals will be evaluated for scientific merit, potential to contribute to the global community’s understanding of specific climate and environmental challenges and development of effective strategies to mitigate them, and the capacity of the research team to manage a sustained research project. In return for this support, winning scientists agree to support open science by publicly releasing the research data from their collaboration with us, enabling the global community to benefit from and build upon their findings. Scientists from around the world are encouraged to apply at https://www.worldcommunitygrid.org/climate.action, with a first round deadline of 15 September. 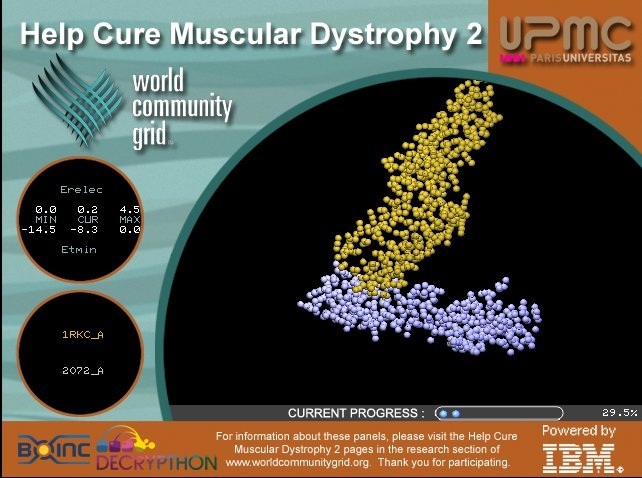 Individuals and organisations can also support this work by joining http://www.worldcommunitygrid.org to donate their spare computing power to the winning research projects. Climate change is a serious threat to people and our planet. And time is of the essence. We know that businesses and citizens themselves are critical to meet this challenge. IBM is proud to stand with the #WeAreStillIn coalition, the broadest cross section of the American economy that has pledged its commitment to help continue leading the global fight against climate change. All of us must be a part of the solution. World Community Grid is giving scientists, citizens and their computers the ability to work around the clock for change. While you’re asleep tonight, your Android phone can work on potential cures for the Zika virus. While you’re in a meeting today, your computer can help develop new cancer treatments. The computer and Android devices you use every day can contribute to groundbreaking research in health, clean energy, and other humanitarian causes. How is this possible? 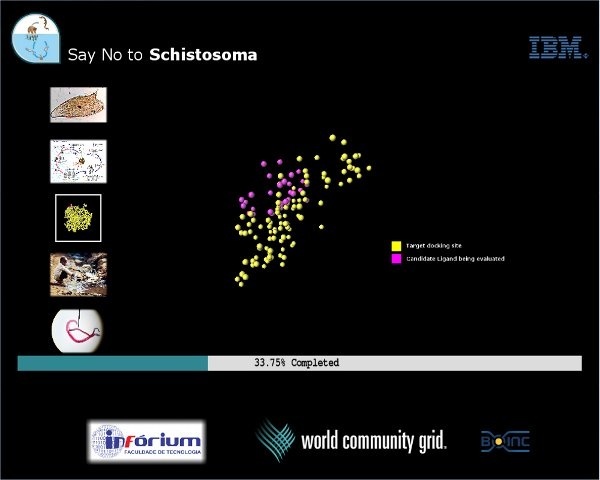 IBM’s World Community Grid enables anyone to donate the spare computing power of their computers and Android devices to help researchers find the next breakthrough. This IBM philanthropic initiative, winner of a 2016 People’s Voice Webby Award, is a safe, easy way to put an unused resource to work for good, without having any impact on your own use of your devices. Why does this matter? Because in research, time is measured in money and lives. Quicker results mean quicker benefits for patients and more. And the enormous power of World Community Grid means that computer simulations that would have taken years can be completed in weeks or months. It’s even possible for researchers to run projects that are otherwise unaffordable or unimaginable, such as comparing all the genes from all the thousands of organisms in a soil sample, modeling water flows at atomic levels of detail, or searching through an enormous index of chemical compounds to find a treatment for the Zika virus. World Community Grid is the world’s largest volunteer computing initiative dedicated to tackling projects that benefit humanity. World Community Grid essentially turns each connected device into one part of a massive virtual supercomputer. It breaks down complex research experiments into millions of smaller units and sends them to individual devices, including desktops, laptops, tablets and smartphones to work on when they’re idle. The results are then collected and delivered to researchers. By harnessing the unused computing power of more than 715,000 volunteers’ computers and Android devices around the world, researchers are able to access dedicated computing time worth hundreds of millions of dollars and conduct research — research that could have taken years — in weeks or months. The Zika virus began spreading rapidly through the Americas in 2015, and there is no vaccine or effective treatment for the disease. Moreover, Zika has been linked to severe neurological complications in some adults as well as serious brain and development problems in some infants whose mothers contracted Zika while pregnant. A multi-institutional group of researchers is using World Community Grid to identify which of millions of chemical compounds might lead them to a cure for this virus. More than 50,000 volunteers signed up to help in the project’s first two months, but with additional volunteers the researchers will be able to make even more progress. A billion people lack access to clean water. Droughts decimate once-fertile farmlands. Ocean water is plentiful but, of course, too salty for most urgent needs. Now an international group of scientists, using the massive computing power contributed by 150,000 World Community Grid volunteers, has uncovered important new information about applying carbon nanotubes to water shortage issues. These tiny water filters have the potential to provide more affordable, efficient access to clean water — and contribute further to energy and medical research. Tuberculosis (TB) has plagued humans for thousands of years, yet it remains one of the world’s most dangerous diseases. About one-third of the world’s population harbors the TB bacterium, with 1.5 million infected people dying in 2014 alone. The World Health Organization now ranks TB alongside HIV as the world’s deadliest infectious disease. 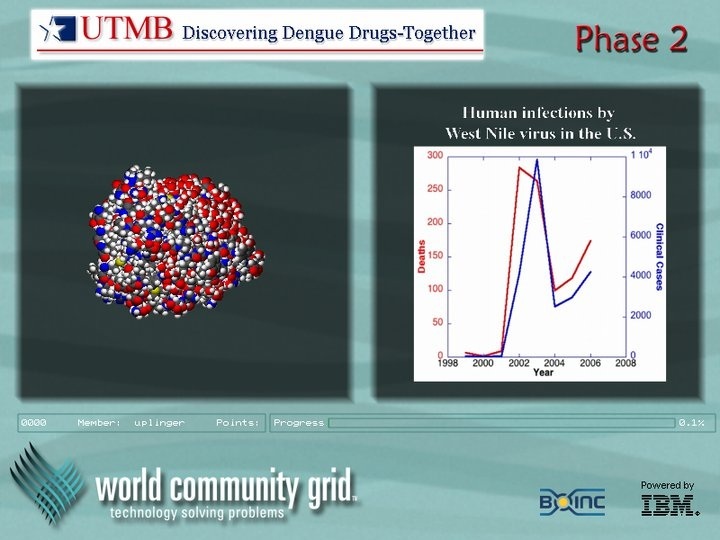 Researchers are using World Community Grid to help understand the molecular structure of the TB bacterium to come up with more effective treatments. Partnering with the Chiba Cancer Research Institute and Chiba University in Japan, World Community Grid launched a project to search for new treatments for neuroblastoma, one of the most common and dangerous forms of childhood cancer. Out of more than three million drug candidates screened by 200,000 volunteers, seven promising drug candidates with no apparent side effects were identified in 2013. The highly successful in vivo test results are a major milestone that sets up the research team for the next step: human trials. In 2013 Harvard University announced the discovery of more than 35,000 compounds with the potential to double the rate of efficiency of most carbon-based solar cells in production today, after scanning more than 2.3 million materials on World Community Grid. Previously, carbon-based solar cells were made from a handful of highly efficient molecules that were painstakingly discovered one by one. Now, there are thousands more to explore: an exponential increase. 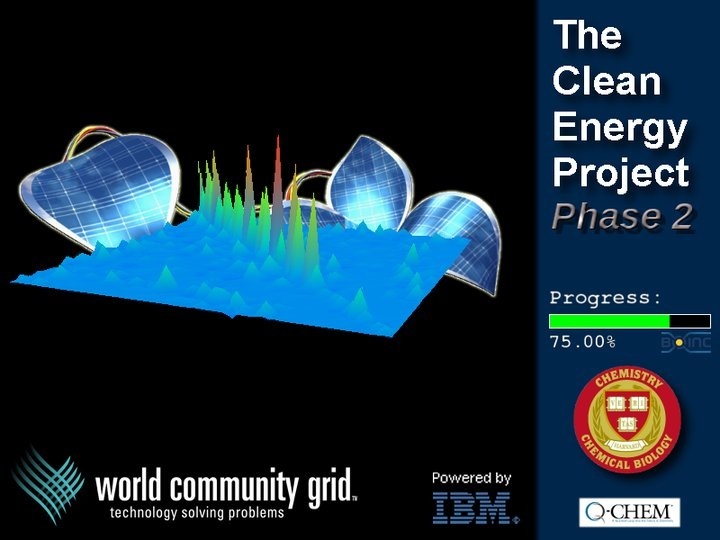 The Clean Energy Project (CEP2) at Harvard University gives us the look into IBM’s contribution to the betterment of Society via World community Grid (WCG). You can visit the WCG web site (link is above), download the BOINC software agent, and attach to the Clean Energy Project. We would love to have you. The mission of The Clean Energy Project is to find new materials for the next generation of solar cells and later, energy storage devices. By harnessing the immense power of World Community Grid, researchers can calculate the electronic properties of hundreds of thousands of organic materials – thousands of times more than could ever be tested in a lab – and determine which candidates are most promising for developing affordable solar energy technology.